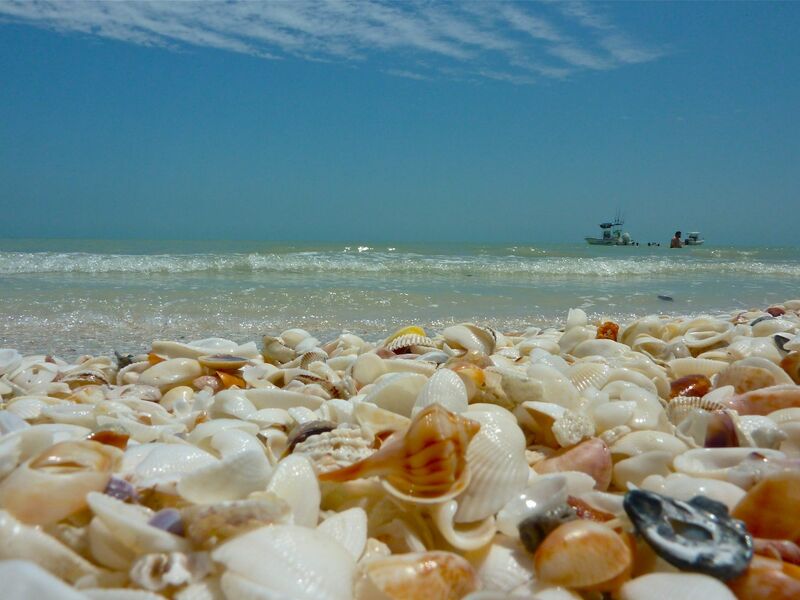 The private beach at ‘Tween Waters Inn is one of the best places in the world to shell. Really, it’s truly a world-class beach and renowned. The beach setting on Captiva Island when we were shelling together was quiet and the beach was peaceful. The island coastline runs beside the famous, Gulf of Mexico. This is one of those places loved for many good reasons, and that includes because the water on the west coast of Florida is usually calmer and warmer than in other places. Along the shoreline, gentle waves roll in and roll out bringing sand and shells to the surface 24/7. The new shells are wet and glisten in the sun after they are washed up. When just moments before, they were tumbling on the sandy bottom underwater and safely out of sight. Ask around the resort when high tides and low tides are expected so you can get into the rhythm of the Gulf and pick up timing tips. Shelling enthusiasts often find the very best shells in the shallow water ankle deep from the shore. Some like my husband, gently mine for the shells in the sand with a bucket or a shovel-full at a time. Digging in the sand is a way of locating the shells that are temporarily covered up between tides that pull and deposit more and less sand on the beach on a regular basis. When we finds great ones but they are alive, we always toss them back. There are plenty more uninhabited ones ready for collection. As I stroll along, I spend my energy gazing over the shells in the wet sand. I’m looking for pops of color that attract my attention. I always keep an eye on the water’s edge, where some shells come and go as soon as one wave arrives and the next wave leaves. Higher up on the shore I also check out the shells that are paler, often broken, and sometimes bleached by the sun. It’s surprising how many good things I find among the seemingly forgotten ones, too. It you find yourself on a spontaneous shelling adventure without a container for your shells, use your shirttail in the front to hold what you find. I travel with bandanas and have used them to hold a sack of shells to carry home many times. Avid shellers use fine mesh bags with strings. Some of the littlest shells are perfect but small, and a joy to collect in tiny jar. Mesh shelling bags will let you rinse off the shells in the surf without risking a wave rolling in and carrying away your find. It happens, especially when you have too many in your hand at one time and want to rinse them. Shelling always gives me time to pause and ponder all kinds of good things and to simply ‘om-out’ from everyone and everything else around. I get some sunshine, plus a little exercise walking in the sand, strolling the shore, and a good stretch when I’m bending over or “stooping” to pick up the shells. When you sit down to relax, take a few minutes to sort your shells. This is how you get an idea of what can be found, the ones you like the most, and which ones you must leave behind. Trust me! No sheller can carry them all home every time. Anyway, it’s always nice to leave some around for the next sheller that comes along. Most importantly, use the time to enjoy!